This statement colored diamond ring features an open lattice style consisting of ten 1.79 ct. tw. oval shape fancy multi-colored diamonds, comprising a lively mix of orange diamonds, yellow diamonds, green diamonds, pink diamonds and purple diamonds, set in 18K white gold. Each natural colored diamond is enclosed within whimsically shaped halos of 166 white accent diamonds that also adorn the elegant split shank of this fancy multi-colored diamond ring, 1.40 ct. tw. 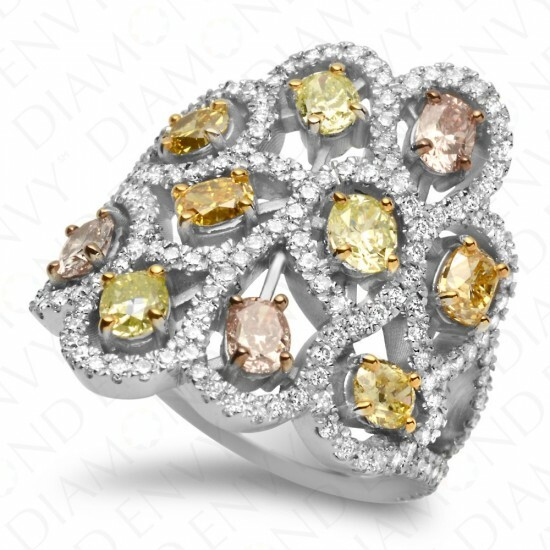 This one-of-a-kind fancy colored diamond ring is at once commanding and classy. Gold weight: 8.75 grams. House-graded.